Wingin' It is a 2 vs. 2 minigame in Mario Party 7. Its name comes from the expression "winging it", which is when someone reacts to things as they happen and improvise, rather than planning things through in advance. Two players jump into the flying Koopa machine. The screen splits into two to show the other team. 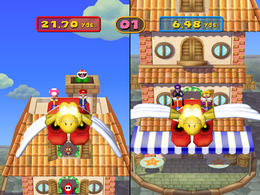 In this minigame, both teams of players are in large Colossal Koopa Paratroopa-like aircraft, and need to rapidly tap the to flap its wings, to get to the top of a building. As the teams fly up, Koopa Troopas, Shy Guys, and Goombas inside will open to windows to wave at the teams while a Piranha Plant pops out of the chimney. The team that ascends higher after ten seconds wins the minigame. For some reason, should both teams get the same distance, the red team always wins. Rules – "Repeatedly tap to flap the wings and get the flying Koopa airborne." Advice – "Tap really fast! That's all there is to it. Easy, huh?" Habatake! Meka patapata Flap Away, Mechaparatroopa! This page was last edited on December 20, 2017, at 10:29.